I spent my teaching career working mostly with children who were challenged in the reading process. I know how important it is to provide books they find both entertaining and interesting at their independent reading levels. A former elementary education teacher, Douglas carefully-crafted “The Tale of Tumeleng” to help children discover the joys of reading while nurturing positive attitudes, good character traits and creative thinking. “I spent my teaching career working mostly with children who were challenged in the reading process. I know how important it is to provide books they find both entertaining and interesting at their independent reading levels. It is my earnest hope that what I write will help children discover the magic of reading and develop a lifelong respect for the value of books,” Douglas said. 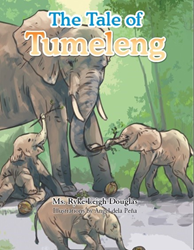 Inspired by the request of third-grade students, “The Tale of Tumeleng” depicts the growth of a fictional baby elephant. The book entertains children while simultaneously teaching them about the daily lives of elephants and the struggles threatening their existence. “Elephants are very beautiful, intelligent animals, and there are many parallels between their lives and ours. I use those similarities to provide parents and teachers with tools to help educate children both in and out of the classroom,” Douglas said. For more information, visit http://www.rykeleighdouglas.com.